Margaret Logan Cabell, known as Nonie, was born in 1902 in Cincinnati, Ohio but spent her childhood near the James River in Warminster, Virginia. She always said she learned to ride even before she could walk. She attended the New York School of Applied Design for Women, now part of Pratt Institute, from 1917 to 1919 and the New York School of Art, now called Parsons The New School for Design, in 1921. While in the City, her brother Philip introduced her to his Princeton roommate, Sydney Baldwin Self, and the two married in 1921. In 1923, the couple left South Orange, New Jersey and rode their two horses to New Canaan, settling at Point o’ Forks Farm in Carter Street. 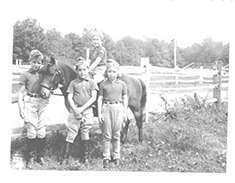 The Selfs had four children whom she started riding at age two: Sydney Baldwin Self, Jr. (Skip), Shirley Self Brotherhood (Lee), Hartwell Cabell Self (Toby), and Virginia Logan Self Bucklin (Gincy). 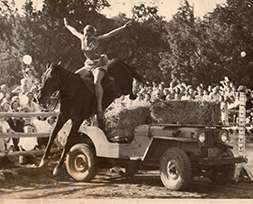 In 1929, Self opened the Silvermine School of Horsemastership at Point o’ Forks Farm with Mr. Verl Sturgis Crew and began to instruct professionally. Pinched by the Great Depression, the Selfs feared that that they might have to sell their horses in the early 1930s. This threat spurred Mrs. Self to begin the writing of a long series of both fiction and nonfiction books about horses. “I had to do that or give up our horses,” she recalled, “and I couldn’t give them up because they meant too much to the children and me.” She published upwards of forty volumes, beginning with the fictional Red Clay Country (1936). 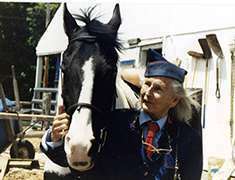 Her first nonfiction work, Teaching the Young to Ride (1934), was based on her own teaching methodology. Her 1946 reference guide, The Horseman’s Encyclopedia, won Mrs. Self wide recognition and commercial success. Some of her works were fictionalized true stories, and her first long fiction title, Sky Rocket, was based on New Canaan Mounted Troop, of which she was Commandant. The original Sky Rocket she rescued from ill treatment and rehabilitated. 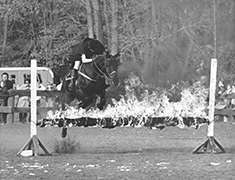 Impressed by a Junior Cavalry of America ceremony she had observed in New Jersey, Mrs. Self took a course in officer training with Major Harry Disston, who guided her in organizing New Canaan Mounted Troop in 1939 as the fourth regiment of the JCOA. She had three female assistants and Major Disston acted as Squadron Commander until he was called on active service in the Second World War. 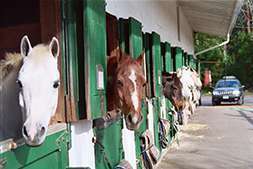 Mrs. Self did not believe in allowing a child’s financial situation to limit his or her access to horses––a philosophy that lead to the uniforms, everyone working around the barn, and the sharing of all the horses. She was actively involved in running NCMT for some twenty years, leading adventures with her students to places like Ireland and Mexico. There are two accounts of how Mrs. Self was able to obtain financing to build an indoor ring for NCMT, both equally impressive for a woman running a somewhat impractical small business at the end of the Great Depression. The first story is that she went to the bank in New Canaan to borrow money for the first indoor ring so she could keep the program going year round. It never occurred to her that the bank would not loan money to a woman in the late 1930s, and she got the loan. The second story is that she talked the builder and lumber supplier into extending her credit which she was able to repay with revenues from the riding lessons. Whichever account is accurate or that you believe, either one would be a remarkable achievement and a testament to her confidence and leadership skills. After the departure of their youngest, and facilitated by her success as an author, Self and her husband enjoyed their twilight years. Beginning in 1959, the pair wintered in Mexico, where Mrs. Self was advisor-consultant to the Escuela Ecusetre de San Miguel Allende, and taught English classes for local residents–she was fluent in Spanish. In 1962, the Selfs moved to Block Island, where Mrs. Self played the violin and viola and was an enthusiastic lover of fishing. She co-founded The Block Island Times in 1970 with publisher Dan Rattiner, where she used the first facsimile machine anyone had ever seen to run the newspaper. She embraced new things and new experiences such as being one of the first people on the island to have a microwave oven in her home when others were years behind in getting one. While on Block Island, Mrs. Self opened another small riding school, and she called the riders “mini-Mounties” in honor of NCMT. Mr. Self died in 1980 and Margaret Cabell Self passed away in 1996. Today, NCMT seeks to further its mission as a nonprofit organization devoted to building leadership, responsibility, and confidence in youth through sound horsemanship. Horses and ponies are still donated for use by all who participate in our programs. Troopers continue to earn honor bars and promotions in rank which are announced at the Review ceremonies. All Troopers are committed to each other, to being good citizens, active in the local community as well as excellent horse people. NCMT is still thriving today and this is an enduring testament to Mrs. Self’s service to her community. More photographs of horses and riders can be found on-line, click the following link NCMT Alumni.